After 15 years at the helm I leave behind the day to day management of our Railway and wish the new management team great fortitude and energy to move our Railway ever forward. including traversing a 1 in 25 Incline. most of Duffield track is laid. 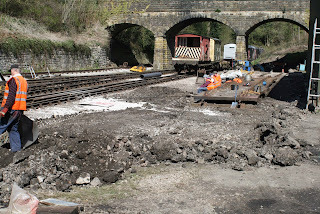 The PWT continued work on the Shottle North Groundframe. Ignore my previous year! Must be demob happy. Today's test customer preparing for the day's activity. 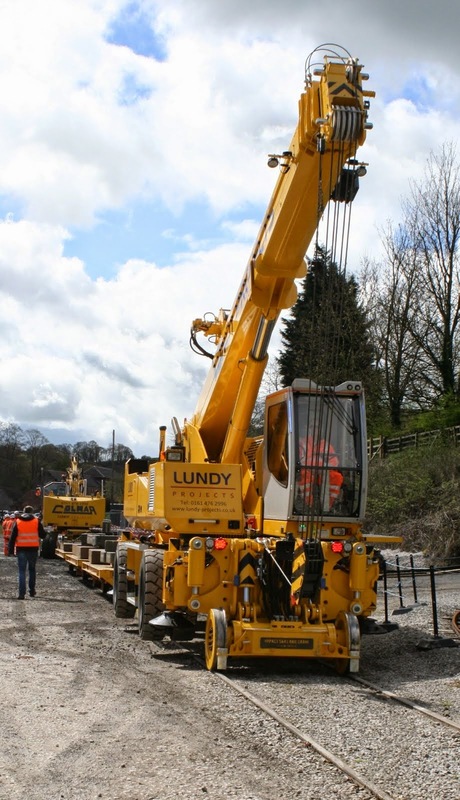 The very large road rail crane arrived in the early hours of this morning from Holland. volunteers do a very important job. the EVRA SK internal woodwork. Two lorries arrived with trailers for the Crane testing Wednesday. Our two young DMU fitters reblocked 51188 completing its A Exam. 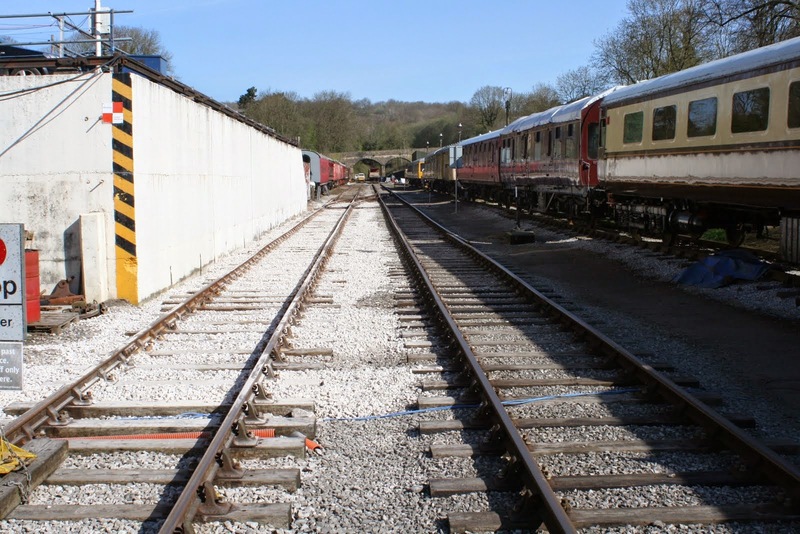 Peace in the Peak today as the station team used the sunshine to touch up more paintwork on the temporary buildings. The Booking Office continued busy with Shottle Soiree bookings and we greeted a member of the DMU Group West Midlands who popped in on the off chance. 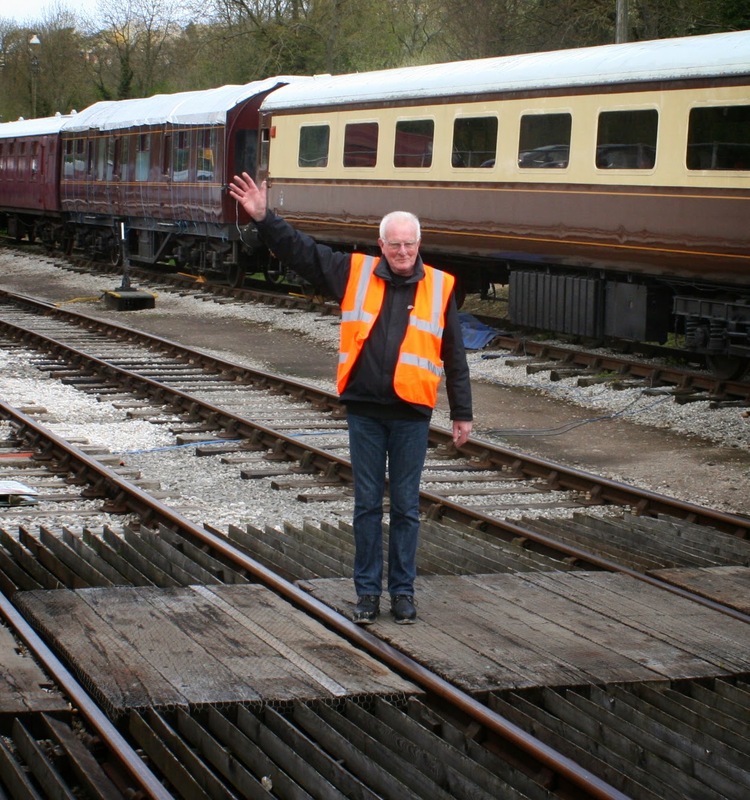 They operate Cl108 vehicles on the Severn Valley. He was very interested in the work done so far on the PW bubble. The BSK team were out in force as was exterior maintenance on the 31. Attached is a photo of a display for an event in June. These replica packs are for sale in the Booking Office at Wirksworth. we will see a LUL at Wirksworth. together with three large trailers which will be unloaded by a crane. correctly so delivery lorries can access the second car park. compound and fitting the 240 volt external socket. 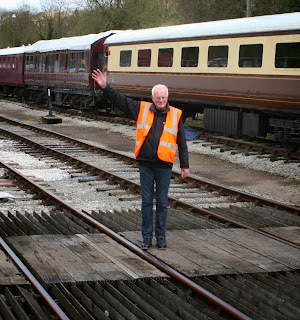 working the Cream Tea Trains which will commence early June. 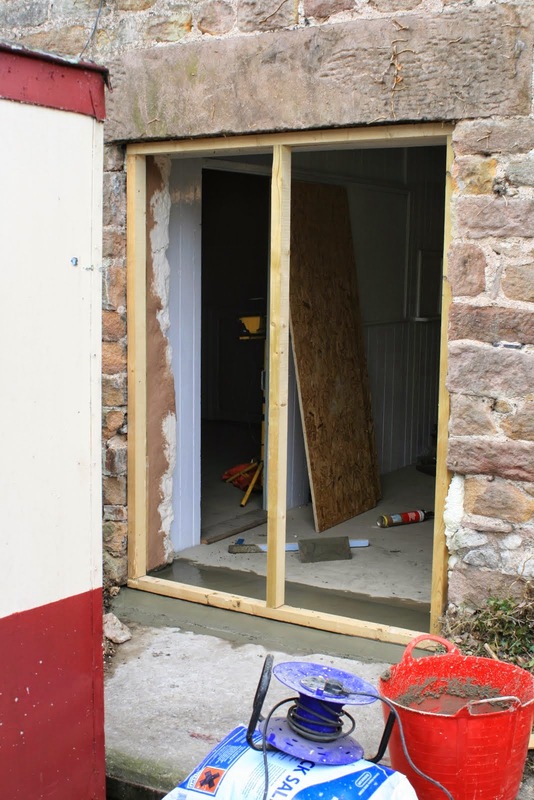 A couple of progress photos showing the newly created entrance to the "Tannery" which will be the Booking Hall of the future for Wirksworth. Lots more to do but the project is inching along in the right direction and the other shows the final ballasting of the track relaid past the "dust dock". 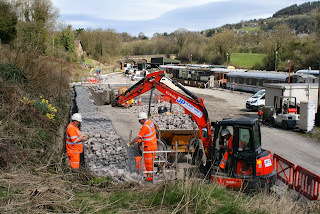 This resulted from the residue of stone ordered for the Great Wall of Wirksworth and kindly donated by the contractor. The end product looks great. Quite a hive of activity for a Monday. The VCT attended to an issue reported by a neighbour near Duffield today in the sunshine. The Works Train tripped to Shottle and great progress was made with installing the other ground frame to progress the loop project. Also out and about the weedkilling team had their first pass of the season. The BSK kitchen progressed further with undercoat on the ceiling in the remaining guards van. A peaceful day at Wirksworth which saw a meeting this morning about the 1950s event, among the many phone calls to book the Shottle Soirée experiences. The station team decided to take a small break from the new Booking Office to concentrate on minor beautification of the current station. Our selection of portable buildings seem to have fared particularly badly over the last winter so the opportunity was taken to apply some paint and generally tidy up whilst it is dry. London Underground completed their driver training exercise on Pam with a trip being made to Idridgehay and back. Also completed today, at last, is the Wirksworth Wall. We await the departure of the machinery! The BSK progressed with more undercoating continuing. London Transport Shaumer Loco traverse the Incline most of the day. stop the nearby Bungalow flooding when it pours with rain. The lone DMU group fitter started an A Exam on 51188. 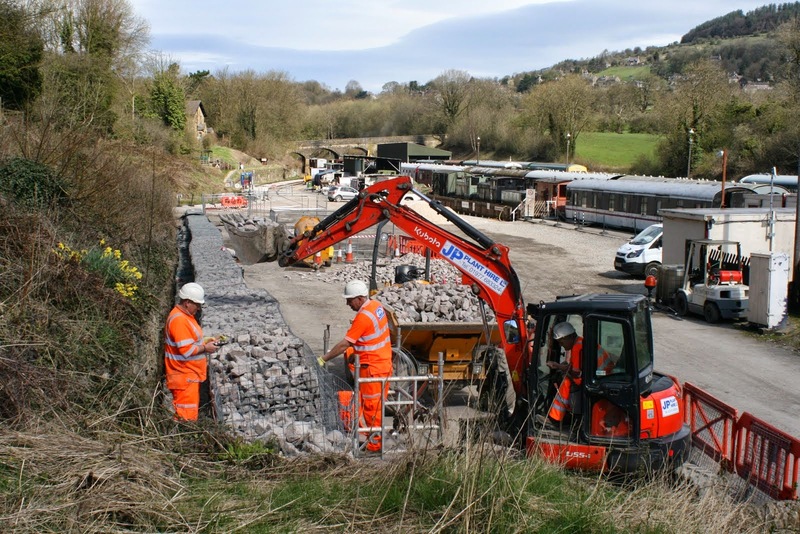 The Great Wall of Wirksworth nears completion and will be a Wonder of the World probably visible from the Moon with many thanks to Network Rail. 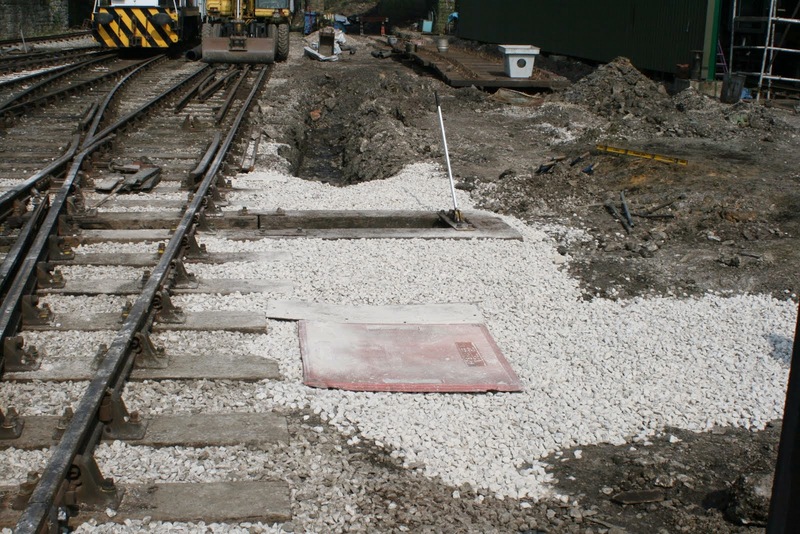 The Maintenance Facility drainage project has also been completed allowing for a further extension of the third road. A little experiment north of Milford Tunnel is attached achieved whilst testing my new motorcycle helmet - idle hands! A quiet day which saw Rodurz at Duffield soiling and a 6 man VCT team having plenty of fires around the 134 area in their quest to open up the views and repair the fencing. At Wirksworth, the walling contractors certainly had plenty of materials delivered as finally they near the end of the project. Spoil was also collected today. The Booking Office cleared a backlog of e-mails from over the weekend and the LMSCA beaded and sanded in the new kitchen. So the warmest day of the year so far saw a nice peaceful day without trains allowing much catching up on the admin front. The phone didn't stop ringing with the recent advertisement of the Shottle Soiree on Groupon causing much excitement. 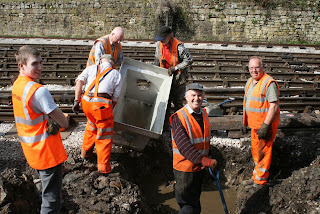 The LMSCA worked on the BSK and Team Tannery worked on the new Wirksworth Booking Office. The floor has been finished in the store room now, the emergency exit frame was also installed today and the office/shop divide was panelled. The DMU Team washed Iris and 55006 and the PW bubble received some more welding repairs on the front. A short interlude at Cromford Station for you. There we have it! A day off tomorrow, sort of. We have just come through one of the longest continuous runs of passenger service days we've ever had. We have had lots of happy passengers over the last 10 days and the weather has been largely kind to us from Saturday onward. I would like to thank everybody for their efforts in ensuring that there were no dramas with the service trains and no headaches on the rota either. Today was generally busier than yesterday and Tuesday, with 61 on the 11:15 from Duffield. The DMU team, pitless, decided to use the nice weather to wash the vehicles in platform 1 so that they're all shiny and clean for the public. I asked the Infrastructure Manager what the PWay team had been upto today and he recommends a simple sentence as more than that can't glorify their task any further. They dug holes and laid pipes. A start was made on the doorway to the new Wirksworth Booking Office too. The LMSCA are really getting to grips with the new kitchen in the BSK now and even entertained some customers for five minutes who have booked on to the Shottle Soiree and got interested in what the facilities looked like! What a difference a day makes - where there was a hole there is now a tidy area with water running underneath it. This is after some 40 tonnes of white gold was delivered today and every stone is numbered. One of our supporters. Andy Chubb, found a video on youtube which some of you may not have seen. Into the video around 4 minutes shows Ravenstor as it was some 50 years ago. Car had some good loadings on the Duffield Service. A photo of our superstars dealing with yet another drainage challenge. This is part of the improvements to the Maintenance Facility which moves ever forward but will remain unsung and underground when this stage of the project is completed. All these complex projects seem to move forward at a snail's pace but then it suddenly is done to the credit of all concerned. Another few months to go yet! those with no hair a hat was needed !! Lesley the Lister was heard chugging up and down the Narrow Gauge. is a very good start to the weekend. air by Leigh this morning on Radio Derby. having a Pay and Play in the morning. Girls in the Bubbles brakevan. Well I suppose you could have guessed it's a Bank Holiday by looking out the window. It seems the weather features in the progress reports quite regularly really but it does affect so many of the different activities which go on around the railway so it becomes quite important. Today didn't break any passenger records but a steady flow throughout the day rode on both the Duffield and Ravenstor lines. A steam experience first thing this morning went well too. The DMU team spent the day giving the 'bubblecar' a FP examination as it was a rare opportunity to grab hold of it whilst it wasn't running. This is the smallest of the exams and takes approx. 1 day to complete with all things well. It takes in simple oil checks and brake adjustments, things like that. One member of the team spent the day welding on the PWay's 'bubblecar' and this is the subject of tonight's photo. The pillars at the bottom of the cab have been renewed and the sheet steelwork is ready to go back. The interior fibreglass dome has been taken down so that an assessment of work to be done could be done. Actually, this area isn't quite as bad as 55006 was a few years back which is good news. The LMSCA fitted the new water storage tank to the kitchen in the BSK. All was well during a test fit but now the insulation has been wrapped round they did have a struggle, but weren't beaten. Also the rest of the roof space insulation was installed. The Class 31 is gradually receiving new electron storage devices and these are quite heavy so it is a difficult process! Tomorrow morning sees Party Workshops Family Circus come into town for the three days. This is an unusual kind of circus where young and old can take part and learn some of the skills that are used in a circus, including juggling, wire walking, unicycling and the like! The circus will be located on the dust dock which with the recent works going on in the bottom car park could make parking tight. It would be appreciated if people could park on the ballast dock if possible to leave some room for customers. The forecast is good so let the excitement commence! disappointed with the Passenger loadings today. A little taste of today's activities. It may be the first of April but no improvement in the weather so far. We had reasonable numbers for saying it wouldn't stop throwing it down at random intervals. More trains coming up tomorrow! The LMSCA were insulating the ceiling and new partition wall in the BSK ready to put the ceiling panels up. It is important to insulate to keep condensation at bay! The PWay and S&T departments were in go mode today. Construction and testing work on the new Shottle ground frame progressed well whilst the rest of the team were sleeping on chairs… oh sorry, putting chairs on sleepers, for the new road down the side of the shed. Meanwhile, various DMUs had a clean ready for the coming days.